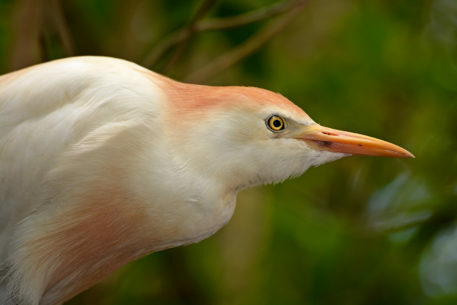 The short, thick-necked Cattle Egret spends most of its time in fields rather than streams. It forages at the feet of grazing cattle, head bobbing with each step, or rides on their backs to pick at ticks. This stocky white heron has yellow plumes on its head and neck during breeding season. Originally from Africa, it found its way to North America in 1953 and quickly spread across the continent. Elsewhere in the world, it forages alongside camels, ostriches, rhinos, and tortoises—as well as farmers’ tractors. Caption by The Cornell Lab of Ornithology. Photographed at Flamingo Gardens in Davie, Florida.